Dáti frá Hrappsstöðum (8.13) is a very good first prize four gaited stallion and a competition horse with extremely good gaits. 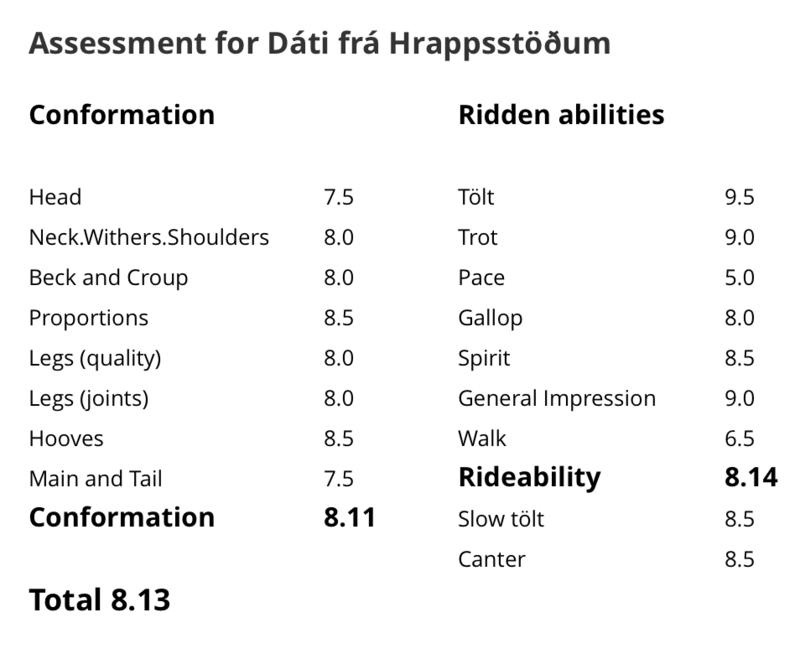 Dáti has 9.5 for tölt, 9 for trot and 9 for general impression. 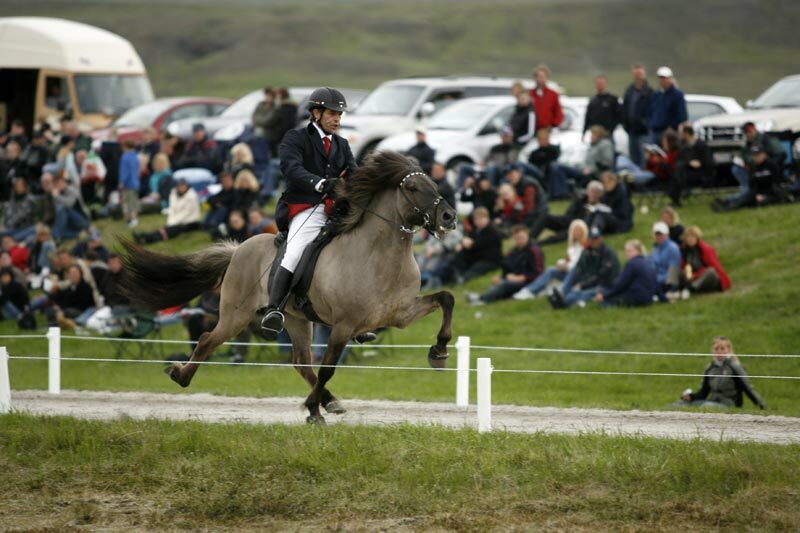 He is son of Sær frá Bakkakoti (8.62) and the four gaited mare Dagsbrún frá Hrappsstöðum (8.04). 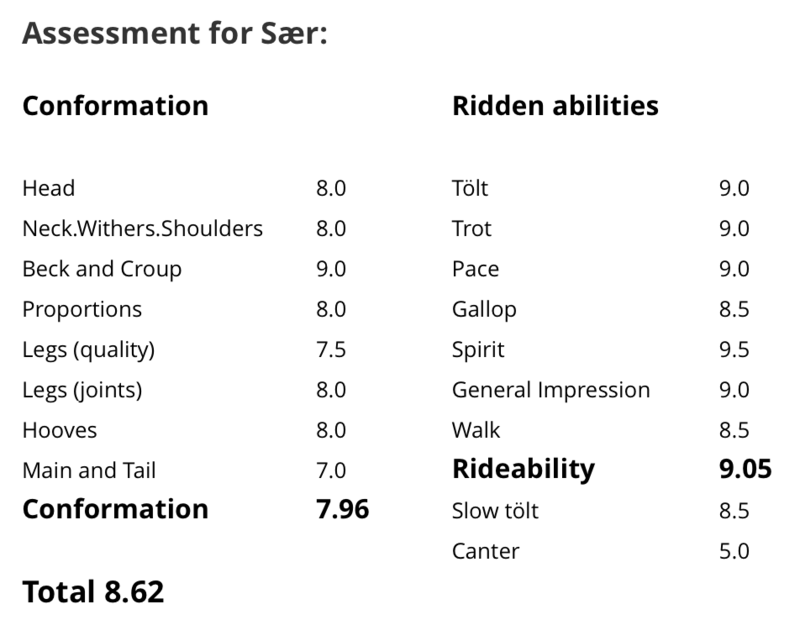 Sær frá Bakkakoti (8.62) has 9.05 for Rideability; 9 for tölt, 9 for trot, 9 for pace, 9.5 for spirit and 9 general impression. 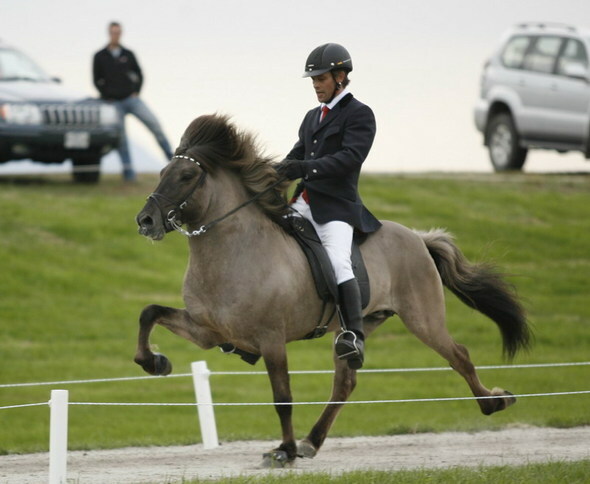 Sær is a light blue dun stallion, he got 1. prize for his offspring at LM2006 and honorary award for his offspring at LM2008. F: Orri frá Þúfu í Landeyjum (8.34). 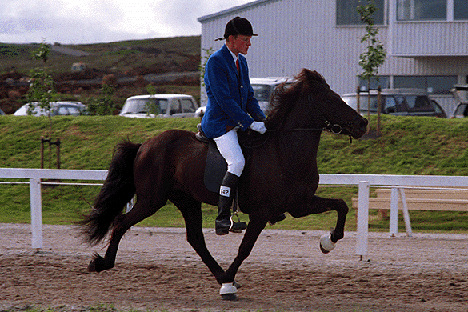 The black and famous, four gaited stallion Orri frá Þúfu had 8.08 for Conformationand 8.61 for Rideability; 9.5 for tölt, 9 for trot, 9 for gallop, 9 for temperament, 8 for character and 9.5 for general impression. Orri got 1. prize for his offspring in 1996 and honorary award for his offspring at LM2000. FF: Otur frá Sauðárkróki (8.37). 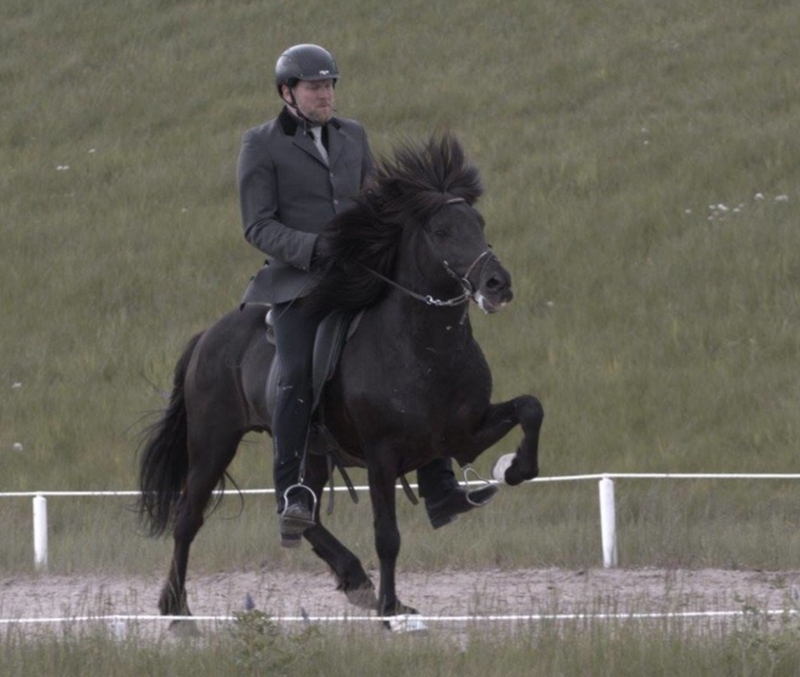 The black and famous stallion, Otur had 8.05 for Conformation and 8.69 for Rideability; 8.5 for tölt, 8 for trot, 9.5 for pace, 8.5 for gallop, 9 for temperament, 8 for character and 9 for general impression. Otur got 1. prize for his offspring in 1993 and again at LM1994. 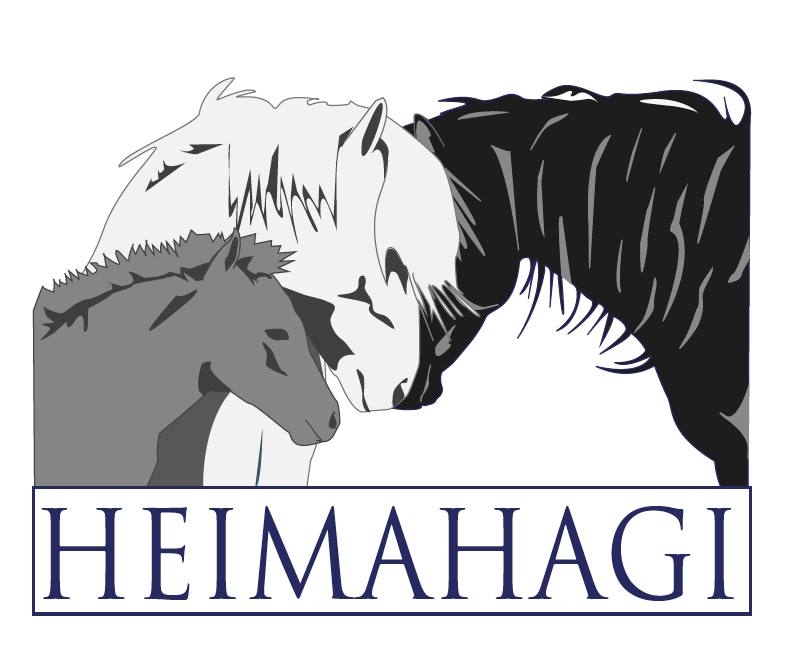 Our was son of the honored stallion Hervar frá Sauðárkróki (8.27) and the honored mare, Hrafnkatla frá Sauðárkróki (8.54). M: Sæla frá Gerðum (8.11). Sæla was a bay dun tobiano mare with 7.99 for Conformation and 8.23 for Rideability; 8.5 for tölt, 8 for trot, pace, gallop, temperament, character and 9 for general impression. MF: Ófeigur frá Flugumýri (8.19). 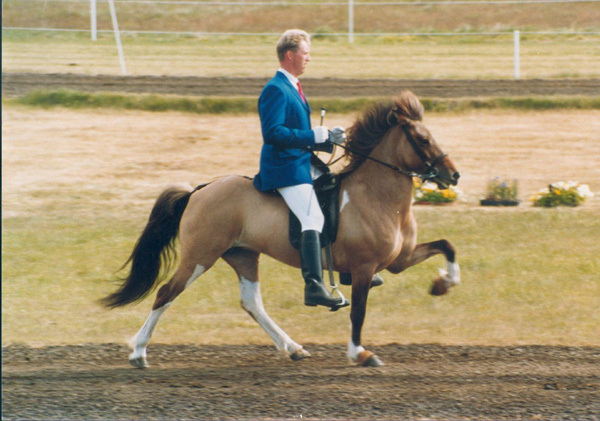 The famous stallion Ófeigur was dark bay dun and had 7.86 for Conformation and 8.52 for Rideability; 9 for tölt, 8 for trot, 8.5 for pace, 8.5 for gallop, 8.5 for temperament, 8.5 for character and 8.5 for general impression. Ófeigur got 1. prize for his offspring at LM1986 and honorary award for his offspring at LM1990. 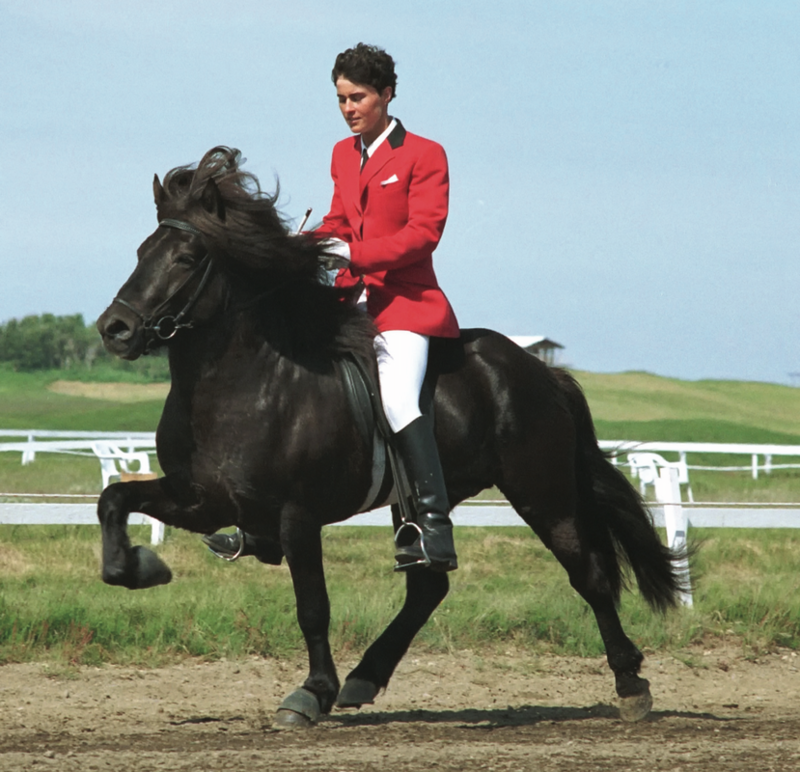 Dagsbrún frá Hrappsstöðum (8.04) is a jet black four gaited mare. 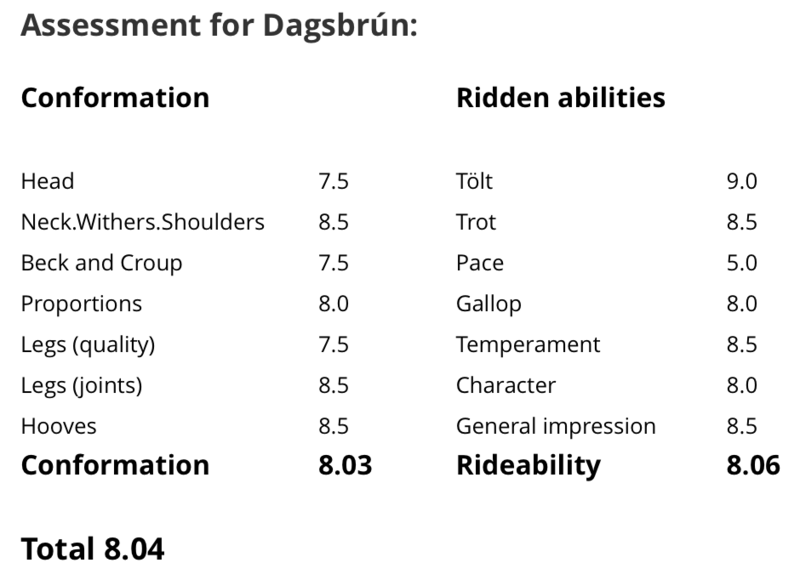 She has 8.03 for Conformation and 8.06 for Rideability; 9 for tölt, 8.5 for trot, 8 for gallop, 8.5 for temperament, 8 for character and 8.5 general impression. She has very strong bloodline. F: Otur frá Sauðárkróki (8.37). 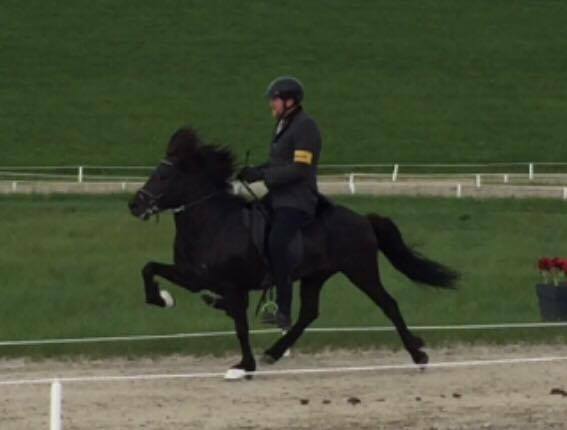 The famous black stallion, Otur had 8.05 for Conformation and 8.69 for Rideability; 8.5 for tölt, 8 for trot, 9.5 for pace, 8.5 for gallop, 9 for temperament, 8 for character and 9 for general impression. Otur got 1. price for his offspring in 1993 and again at LM1994. Our was son of the honored stallion Hervar frá Sauðárkróki (8.27) and the honored mare, Hrafnkatla frá Sauðárkróki (8.54). FF: Hervar frá Sauðárkróki (8.27). Hervar was famous and honored stallion, he was chestnut with 7.95 for Conformation and 8.58 for Rideability; 9 for tölt, 9 for trot, 7.5 for pace, 8.5 for gallop, 9 for temperament, 8.5 for character and 8.5 for general impression. Hervar got 1. price for his offspring in 1987 and was honored for his offspring at LM1990. FM: Hrafnkatla frá Sauðárkróki (8.54). Great, black and honoured mare that had 8.20 for Conformation and 8.88 for Rideability; 9 for tölt, 8.5 for trot, 9 for pace, 8 for gallop, 9.5 for temperament, 9 for character and 8.5 for general impression. Hrafnkatla got 1. price for her offspring in 1982 and was honored for her offspring in 1990. ​M: Dúkka frá Stykkishólmi (8.09). 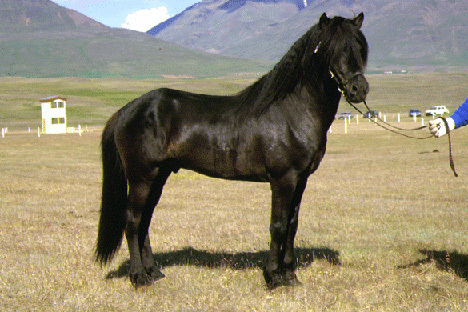 Dúkka was a four gaited mare. She was chestnut with a star and flaxen main and tail with 8.01 for Conformation and 8.17 for Rideability; 8.5 for tölt, 9.5 for trot, 8.5 for gallop, 9 for temperament, 8 for character and 8.5 for general impression. Dúkka got 1. price for her offspring in 1997. MF: Ófeigur frá Hvanneyri (8.55). 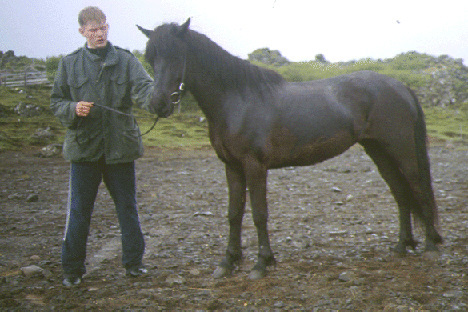 Ófeigur was an honored stallion, he was black with a star and had 8.30 for Conformation and 8.80 for Rideability; 9 for tölt, 8.5 for trot, 9.5 for pace, 8.5 for gallop, 8.5 for temperament, 8.5 for character and 9 for general impression. 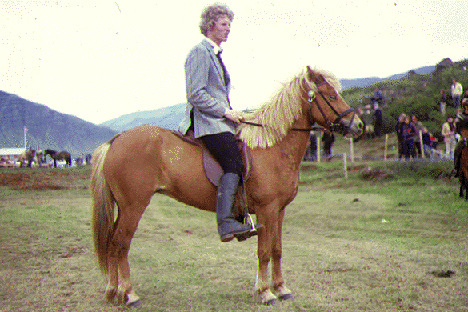 Ófeigur was son of Ófeigur got 1. price for his offspring in 1980, again 1. price for his offspring at LM1982 and then was honored for his offspring at LM1986. Ófeigur was son of Hrafn frá árnanesi (8.01) and Skeifa frá Kirkjubæ (8.17), she got 1. price for her offspring in 1970. MM: Drífa frá Lækjarkoti (7.56). Drífa was a chestnut four gaited mare with 7.70 for Conformation and 7.42 for Rideability; 7.5 for tölt, 8 for trot8 for gallop, 8 for temperament, 8 for character and 8 for general impression. Draft got 1. price for her offspring in 1984. Dáti frá Hrappsstöðum and Jóhann Ólafsson took the 4th place at Sprettur Áhugamannamót Hrímnis og Töltgrúbbunnar, with the score of 6.56. Video from the Finals.